It's Saturday, so what's more appropriate than talking a little college football? As I've started the difficult task of identifying celebrity and sports figures who've made the news due to a domestic violence incident, I spent more time than I would have liked on ESPN.com. To begin identifying couples, I simply typed domestic violence into their search field and began the slog through all of the news articles that populated to identify couples. Now, I'm a baseball fan. So, I was quite curious to see which of the MLB superstars and lessor known players were going to make an appearance in my search term. 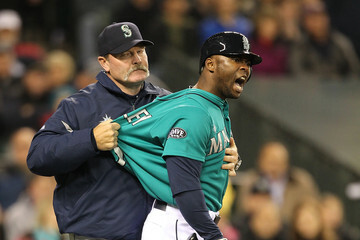 In fact, I was really eager to find the coverage on Milton Bradley, who had a dramatic stint with my team, the Seattle Mariners. It turned out, Milton Bradley didn't even make my ESPN.com list since ESPN.com NEVER actually called it domestic violence in their coverage of his legal troubles. What ended up becoming shockingly apparent however, was the shear amount of reports regarding college football players. To be sure, there were plenty of articles on pro-football players, baseball and basketball players, boxers, and even a jokey. There were also reports of other college athletes. At first glance, it also appears that the players on professional teams were covered more in depth and on an ongoing basis. However, since 2009, of the 47 couples identified on ESPN's coverage alone, 14 incidents involved a college football player (30%). Now, this correlation between sports and domestic violence (DV) is not news to anyone in the movement to end DV. One of my favorite activists, Jackson Katz, has long been advocating for work with student-athletes to prevent DV and surely there are numerous studies that have investigated exactly this topic. One thing I found very interesting about all of these reports was that they were all seemingly independent events- no context related to an epidemic of DV was provided, they mostly didn't seem to reference DV in sports news regarding other players. There were a few gems that DID try to make the connection between all of these incidents (here, here, and here), but they were far and few between. So, while Penn State is continuing to make the news for the horrific events that happened there, a quieter but ongoing epidemic seems to continue to go unnoticed. I am not trying to argue that most college football players are abusive, nor that people should abandon their love of the sport (far be it from me to get in the way of the public and college football!). However, these preliminary insights do suggest a need for ongoing strategies to address DV in the culture of college football. More analysis of these articles may be warranted: How were the incidents framed? Was it making news because of the violence or because the player was going to miss a game? What is the public's reaction to reading these stories? Did the articles blame the victim or hold the abuser accountable for the violence? The activist in me wants to see more prevention work targeted to men and boys. Intervening in sports' culture certainly seems like a worthwhile strategy. Futures Without Violence has produced some excellent material in this vein. Check out there PSA's here.